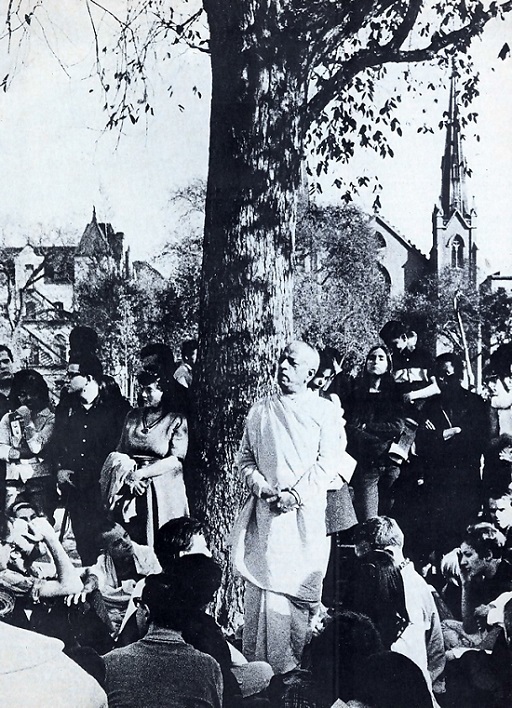 "A devotee can worship Kṛṣṇa anywhere, underneath a tree. Because Kṛṣṇa is in everyone's heart. Īśvaraḥ sarva-bhūtānāṁ hṛd-deśe 'rjuna tiṣṭhati (BG 18.61). So if underneath a tree you think of Kṛṣṇa and chant Hare Kṛṣṇa, that is sufficient. Kṛṣṇa does not require any big paraphernalia. He only wants how you are a sincere devotee. That's all. And that devotional service can be discharged in any condition. Ahaituky apratihatā. It cannot be checked by the material circumstances. This is the process of Kṛṣṇa consciousness. And you see the five-years-old boy, how he was protected from all kinds of dangers and he refused to take any benediction. He refused. The devotee should not be a mercantile man: 'If you give me something, then I shall give you something.' That is business. A devotee is not like that. He understands that he is eternal servant of Kṛṣṇa, his duty is to serve Kṛṣṇa. In the material world a servant works when money is paid, wages. A devotee is not like that. A devotee serves Kṛṣṇa out of duty. That is God consciousness, Kṛṣṇa consciousness, that 'It is my duty.' And then Kṛṣṇa takes the responsibility, 'It is My duty to protect this devotee.' This reciprocation is called Kṛṣṇa consciousness. There is no question of business transaction. Then he will be protected. Kṛṣṇa is nobody's servant, but everyone is Kṛṣṇa's servant. If everyone becomes Kṛṣṇa's servant, then everyone is protected by Kṛṣṇa."